Licorice (the British spelling is liquorice) is found in the herbaceous roots of the Glycyrrhiza glabra plant. These roots provide a distinct confectionery flavor often extracted and inserted into your favorite childhood (and adult) chewy, twisty candies and popular sweeteners. However, licorice root also offers effective medicinal properties dating back thousands of years—even history reports claim that Julius Caeser and Egyptian pharaohs touted the benefits of this healthful plant to cure stomach ailments and skin inflammation. Today, you can use licorice root to fight heartburn and other digestive issues, as well as relish its sugary flavor in the form of sweet treats (as long as you eat them in moderation, of course). When you ingest licorice in the form of hard or chewy candy, such as a sore throat lozenge, the carbohydrate count will typically be high, up to 30 grams per serving. This will burn off quickly in your bloodstream, as well as cause a spike in your blood sugar. In addition, eating one serving will account for up to 7 percent of your total daily calories—not to mention its overall nutritional value remains low. Since you will find a high amount of sugar content, such as 24 grams when eating eight pieces of proper English licorice, the fat content will stay low and typically come from healthy polyunsaturated fats. A serving of licorice contains 1 to 2 grams of protein. The United States Institute of Medicine states that the recommended daily consumption per is 46 to 65 grams of protein. You should look for other healthier sources of protein, such as lean proteins and colorful vegetables, to meet your requirements. Licorice contains approximately 6 percent of your daily requirements of calcium, which is a mineral necessary for building strong bones, enabling your muscles to contract and keep your heart beating right. The National Institute of Health recommends adult men and women get between 1,000 to 1,200 milligrams of calcium per day. Licorice also delivers about 3 percent of your recommended daily iron requirements. Iron remains the most common nutritional deficiency in the United States; men should aim for 8 mg per day and women 18 mg per day, according to the National Institute of Health. Despite the adoration of candy licorice for its ability to satisfy the “sweet tooths” of the world, researchers boast that the actual licorice plant contains surprising beneficial medicinal qualities. A 2017 report from the Centers for Disease Control and Prevention (CDC) states that more than 100 million Americans have diabetes or prediabetes. Licorice root may help combat this steadily growing condition. A study from the Proceedings of the National Academy of Sciences of the United States of America found that licorice root contains substances with an anti-diabetic effect and might serve as an effective aid in the treatment of type 2 diabetes. In fact, licorice root received the prestigious label of “Medicinal plant of 2012” because its molecules actually reduce blood sugar and offer anti-inflammatory properties. 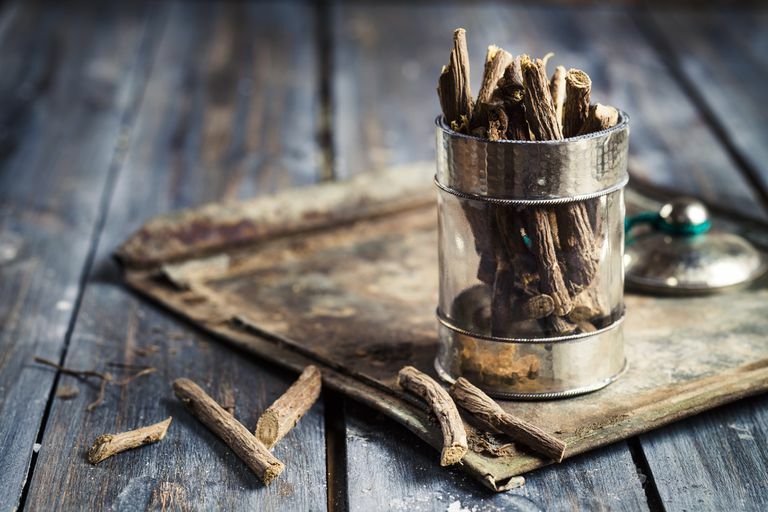 Licorice root can help fight viruses that cause respiratory illnesses. In a 2012 double-blind, placebo-controlled study, researchers found an extract of glycyrrhiza glabra, the plant containing licorice root, actually relieves symptoms of stomach pain. In addition, the root can also act as nature’s antacid and relieve acid reflux, heartburn, and indigestion. In a 2013 study published in the Journal of Research in Medical Sciences, researchers found licorice offered a healing effect against the bacteria “Helicobacter pylori,” a bug that causes stomach issues. The glycyrrhiza glabra extract can help combat skin infections, according to a 2010 study from the Iran Journal of Pharmaceutical Research. Researchers tested licorice root and leaf extracts in their effectiveness of its antimicrobial activity. They found that licorice offers hope as an alternative agent to such skin infections affecting more than 30 million people in the United States. A study from the University of Padua found that eating moderate amounts of commercially prepared licorice has no adverse effects on health. In fact, consuming licorice in the amount of 1.4 ounces a day (or 3.5 grams) can actually reduce body fat mass—but you should not go past that amount or you risk weight gain and heart issues. The licorice root comes from the plant glycyrrhiza glabra, which does not contain gluten. Most licorice herbal tea is also gluten-free, but you should read the label to make sure no other gluten products are added (such as barley). The licorice candy does contain gluten, as it is made with wheat flour. You should always watch your sugar intake and eat any type of licorice root or licorice candy in moderation, but especially with black licorice. In 2017, the Food & Drug Administration (FDA) found that for those 40 years and older, eating 2 ounces of black licorice a day for at least two weeks can potentially throw off heart rhythms. The FDA also states that a person of any age should not eat large quantities of black licorice at any time, as the compound glycyrrhizin can cause potassium levels in the body to fall. Black licorice can also interact with certain medications and supplements. You should consult a doctor if you have any concerns. Constipation: Make a hot, herbal tea with anise to soothe an upset stomach and support digestion. Menstrual cramps: Take licorice as an herbal supplement, which you can purchase at a grocery or nutrition specialty store. Cough: Drink a licorice root tea to soothe the throat. Laryngitis: Try sucking on a licorice lozenge. You should look for deglycyrrhizinated licorice (or DGL) extract on the label, as the glycyrrhizic acid is removed and will keep blood pressure down. High blood pressure or hypertension: You might even want to avoid licorice altogether as the glycyrrhizic acid found in its extract can raise blood pressure. Prone to constipation: An excess amount of licorice root can lead to negative reactions such as diarrhea and irritable bowel syndrome. Pregnant: Licorice can mimic the side effects of too much estrogen and could potentially cause complications. Breastfeeding: This will avoid passing the glycyrrhizic acid onto your baby. To avoid any allergic reaction or drug interactions, you should consult with a doctor before taking licorice root as either an herbal or natural supplement. National Institute of Health (NIH). Calcium. Washington, D.C.:Office of Dietary Supplements (ODS); updated November 17, 2016. National Institute of Health (NIH). Iron. Washington, D.C.:Office of Dietary Supplements (ODS); updated December 7, 2018. Centers for Disease Control and Prevention (CDC). New CDC report: More than 100 million Americans have diabetes or prediabetes. Washington, D.C.:U.S. Department of Health and Human Services; updated July 18, 2017. U.S. Food & Drug Administration (FDA). Black Licorice: Trick or Treat? Washington, D.C.:U.S. Department of Health and Human Services; updated October 30, 2017. Rahnama, M.; Mehrabani, D.; Japoni, S.; et al. The healing effect of licorice (Glycyrrhiza glabra) on Helicobacter pylori infected peptic ulcers. J Res Med Sci. 2013 June;18(6):532-533. Mahboubeh, I.; Sarmadi, M.; Bernard, F.; et al. Leaves antimicrobial activity of Glycyrrhiza glabra L. Iran J Pharm Res. 2010;9(4):425-428.